One Systems Brings Calypso Side Vision To Life | Northmar, Inc. The Calypso Side, located in Anatalya, Turkey offers patrons a unique dining, drink, and entertainment experience surrounded by the sea. The ambience is enhanced by a One Systems sound reinforcement system designed and installed by AKHAN-TT Ses Isik Gorsel sistemler, one of Istanbul’s most prominent sound distribution companies. With a capacity of 400, the new restaurant and lounge required a system that would reinforce the distinctive entertainment program the owners planned to draw guests to their venue. “They envisioned the indoor seating area covered by a system that would provide high-quality background music while the outdoor area system had to provide full sound to deal with the outdoor soundscape,” explains Faik Haluk Akgun, the owner of AKHAN-TT Ses Isik Gorsel sistemler. 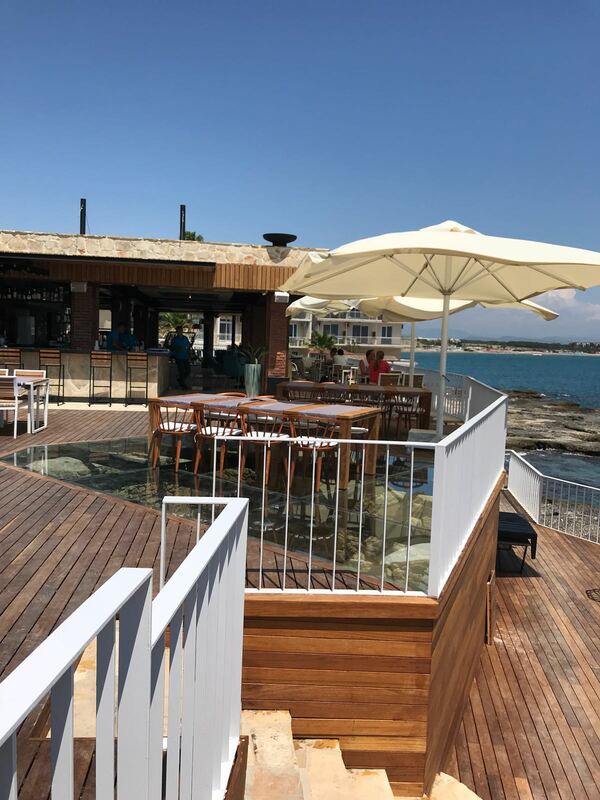 Since part of the restaurant is outdoors and in near proximity to the sea and salt water, Akgun was confident that One Systems direct weather loudspeakers would be the perfect solution. After comparing One Systems loudspeakers to another popular U.S. brand, the owners agreed. 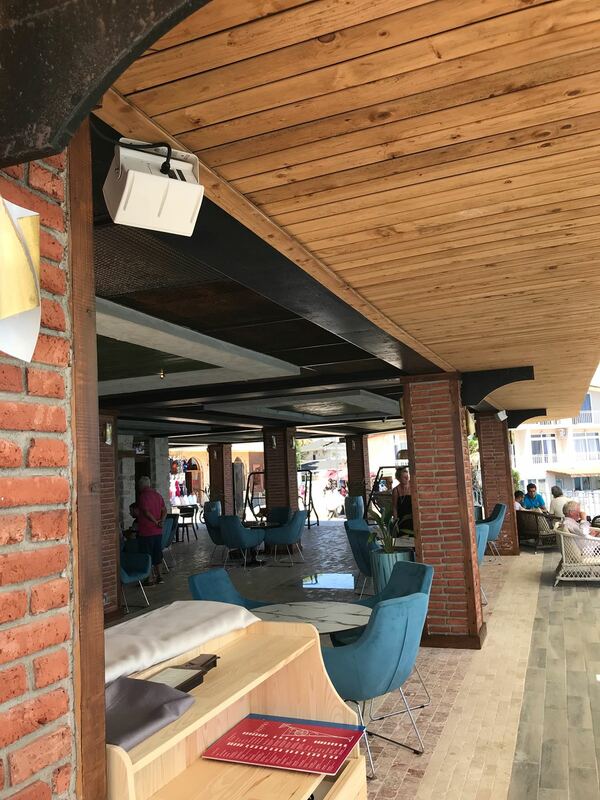 Akgun specified two distributed systems, one for the indoor area and the other for the terrace, both made up of One Systems Direct Weather loudspeakers. Ten 104/HTH are mounted around the perimeter of the bar, pointing inward, to provide guests with medium output that will not overpower their dining experience. He also placed six 106/HTH distributed around the outer perimeter of the bar to cover the outdoor seating area/terrace. One 118/HSB subwoofer is deployed near the bar where the foot traffic is high and guests congregate in the evening. The 104/HTH and 106/HTH are two-way designs offering wide coverage patterns of 110 x 80 and 110 x 70 degrees respectively. The 104/HTH features an elliptical wave guide with optimal loading to the high frequency driver while the 106/HTH utilizes a high frequency driver with very low distortion and superior upper vocal range intelligibility. The 4.5-inch and 6.5-inch low frequency drivers are paired with large voice coils, ensuring high reliability and excellent linearity. The enclosures utilize 316-grade stainless steel (marine-grade) for all structural and rigging points as well as associated rigging accessories. Metal components that are not structural feature a newly developed marine capable poly coating over 304-grade stainless steel. This allows One Systems Premium Hybrid Series of loudspeakers to be used in ocean front and cruise ship applications, making them the ideal choice for this application.